Civil society groups and experts have welcomed a landmark report from the Committee on Climate Action and called on the Government to quickly roll its recommendations into its climate policy. The report includes recommendations to ramp up renewables and home retrofitting, to bring down agricultural emissions while supporting on-farm biodiversity, and to facilitate greater community involvement in the low carbon transition. Recommendations to embed climate into the educational curriculum and for new broadcast media guidelines for climate coverage were also included in the final report officially released today. The recommendations are set to be included in the government’s upcoming All-of-Government climate plan and the National Energy and Climate Plan (NECP). “This milestone report sets a baseline of ambition that will help put Ireland on the right track towards playing our part implementing the Paris Agreement,” Stop Climate Chaos policy coordinator Catherine Devitt said. “This Oireachtas Report provides an unprecedented, historic cross-party mandate, that if acted and built upon without delay, will help change the course of Irish climate policy, reduce Ireland’s growing emissions and honour our national and international climate obligations,” she continued. 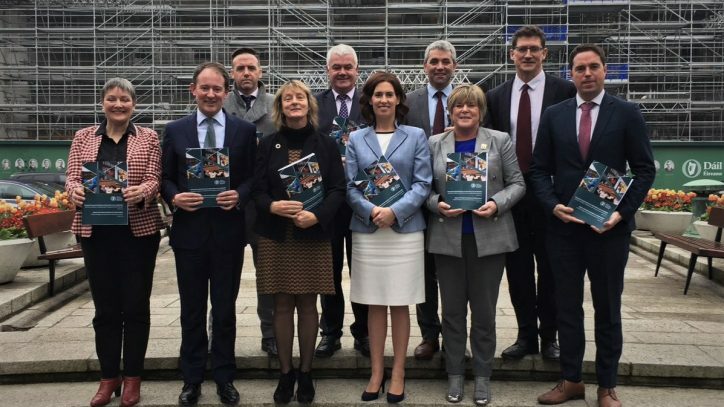 The cycling advocacy network Cyclist.ie also welcomed the Committee’s report in relation to its proposed transport investment in active transport infrastructure. “The cross-party recommendation for an allocation to cycling of 10 per cent of transport investment is a momentous decision,” the group’s chairperson Colm Ryder said. When properly spent, he said that this investment will ensure that the government delivers “far ranging change” in carbon emissions, as well as health benefits, less traffic congestion and a reduction in both air and noise pollution. The CEO of Tipperary Energy Agency Paul Kenny stressed in the wake of the report’s launch that a “considerable amount of work” awaits civil servants to implement the proposals in the report. “If we are to see genuine action, the severe under-resourcing of the Department of Climate Action and the other state and local agencies needs to be addressed,” Mr. Kenny said. Michael Ewing of Environmental Pillar also urged the Government to adopt biodiversity-related recommendations in the report in order to “develop a real and lasting strategy to turn us from laggard to leader on climate action”. Key environmental policy recommendations in the report include support for the restoration, rehabilitation and rewetting of all peatlands, as well as the preparation of a national hedgerow conservation strategy that recognises the climate benefits of our national hedgerow resource. The report also calls for the State to prioritise a forestry model of native trees and biodiversity-rich woodlands and to reward farmers for the active maintenance of ecosystems. Emeritus professor at NUI Maynooth John Sweeney also welcomed the report but told The Green News today that there were two areas he would have liked to have seen tackled more intensively. “I think agriculture still remains in aspirational terms and many of the recommendations are pretty dated [as] they go back to 2012 and we haven’t managed to do anything about them seriously in the intervening period. Transport as well is not really hitting the bullet,” the climate expert said. Prof Sweeney added that since these two sectors combined account for a large chunk of our emissions, we “have a problem in terms of implementing the report”. Prof Sweeney did also note the positive development of the “monitoring aspect” that a new Standing Committee on Climate will provide to monitor “whether or not we’re actually delivering the goods on this topic”.